Facebook is very, very close to its long awaited public offering this Friday. There is a ton of buzz out there as people expect Facebook to reach a pretty staggering amount of $104 billion if things go well. As a part of Facebook, do you ever wonder how much you are worth to the biggest social media site? Keep in mind – you’re not exactly the customer here. Abine, an online privacy company, stated that around 85% of Facebook’s revenue comes from advertising, which basically means that most of their revenue depends on its ability to collect and monetize your personal information effectively. In short, what makes Facebook so valuable is the huge base of active users. Recently, Abine launched a simple user value calculator, dubbed “Val-You Calculator“, for you to determine how much you’re worth to the social networking giant. 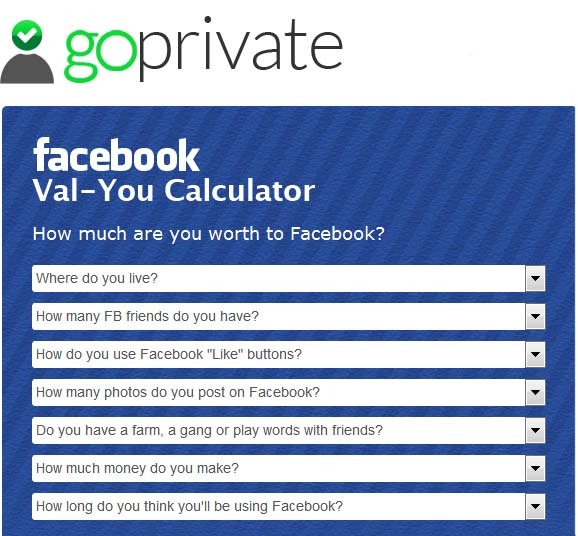 The calculator uses a a seven-question quiz to determines your overall value to Facebook from an advertising perspective. The questions are pretty basic in general, asking you how many friends you have, how often you use the like button or whether or not you play Facebook games, etc. Test it out to see how valuable you’ve helped Facebook become! If you want to reduce your value to Facebook and other online advertisers, then be sure to install Do Not Track+, a free browser extension created by Abine. Facebook is Going Public, Should Your Data Go as Well? Now that Facebook is going public, you should definitely keep track of its policies, as there might be noticeable changes in the future. Abine CEO, William Kerrigan, said that people want a way to seamlessly share pictures, information, and videos on Facebook without having to go through so much trouble controlling the data they share. In a nutshell, PrivacyWatch is a service that will help you keep track of any changes in Facebook’s policies, and it will alert you should there be any changes. This will help set your mind at ease. These alerts can very well protect your privacy and your personal data by making sure that you are well informed of any change of direction Facebook intends. However, PrivacyWatch is not limited to that function alone. You will also receive a couple of emails a week regarding tips and tricks on how to improve your overall security on the social media site. For $1.99 a month, those of you who are conscious of the Facebook privacy and data use policies may surely have a much easier time keeping track of the changes that may come in the future. Click here to read Abine’s official, PrivacyWatch announcement. *Editor’s note: Abine is a paid sponsor of Facecrooks.